Ok, it’s not really THAT bad, but everyone’s still worried, right? 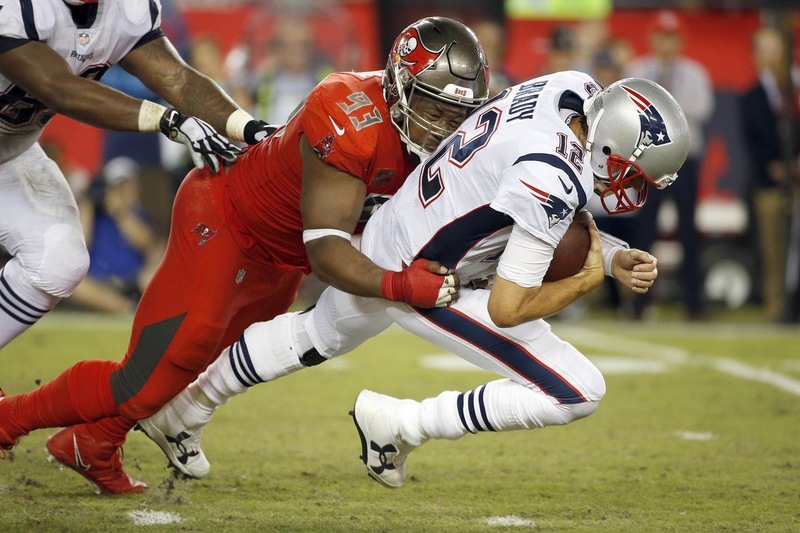 By now you’ve no doubt heard that Tom Brady apparently hurt his left shoulder in the Carolina Panthers game in week 4 (compliments of another of the NFL’s ageless wonders, Julius Peppers) and reaggravated it this past week against the Bucs (compliments of the Patriots’ sieve-like offensive line). Reports have come out that Brady had an MRI which showed no structural damage or tears, and he has been diagnosed with an acromioclavicular (AC) joint sprain. So what does that mean for Brady and the Pats? First, a little about the AC joint in general. 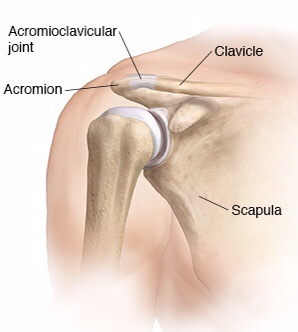 The AC joint is the small joint at the top of the shoulder where the acromion (the top of the scapula, or shoulderblade) meets the clavicle (collarbone). 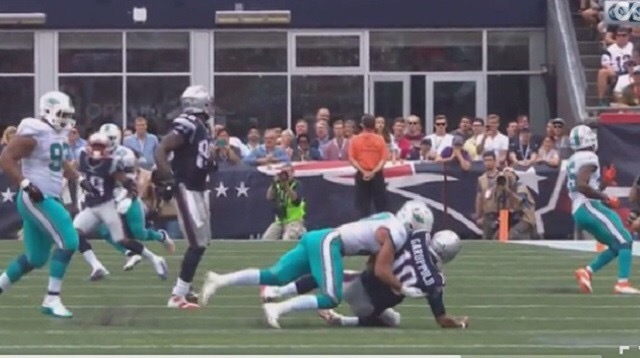 This picture is, of course, Patriots backup quarterback Jimmy Garoppolo injuring his right AC joint against the Dolphins in week 2 last year. Garoppolo’s injury is similar to Brady’s but different in that it was to his throwing shoulder and was apparently more severe than Brady’s, given the amount of time (2+ games) he missed. 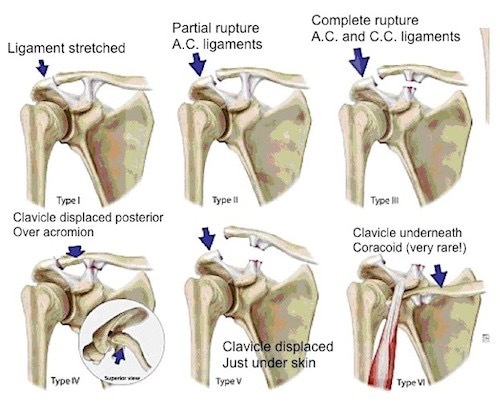 Like a lot of things in orthopedics, AC joint injuries can be of varying severity, denoted by the “grade” of injury. Most orthopedic classification systems don’t go very high in terms of grades because math makes our heads hurt, and AC injuries follow this formula – there are six grades of injury, with grade 1 being the least severe (a sprain of the joint) and grades 2-6 being increasingly severe disruptions of the joint (separations). The vast majority of these are treated without surgery, but the more severe the injury, the longer the injured player will likely be out. In Brady’s case he apparently has a grade 1 injury to his non-throwing shoulder, so the outlook is good for him to miss little, if any, action. He did miss practice today but this should be something which is manageable with a combination of training room treatment, Alex Guerrero/TB12 hocus-pocus, and potentially a numbing injection into the joint around game time. Brady’s ability to play will really come down to pain tolerance- he’s not putting his shoulder at risk structurally by playing – and he certainly has a track record of playing through pain in the past. I’d put my money on Brady being out there this weekend but don’t be surprised if they are more likely to play Jimmy G sooner rather than later in the event of a blowout. For the balance of the season, if the offensive line can keep Brady upright (big “if”, I know) his shoulder shouldn’t be a major concern.